Today, Jo and I spent about 5 hours at Green Cay in Palm Beach, Florida. 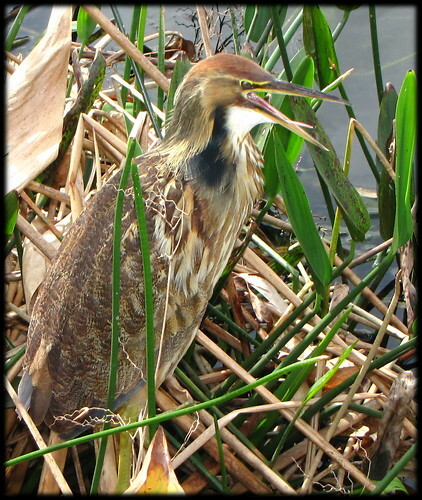 It’s a wonderful wetland area and just full of really neat birds. 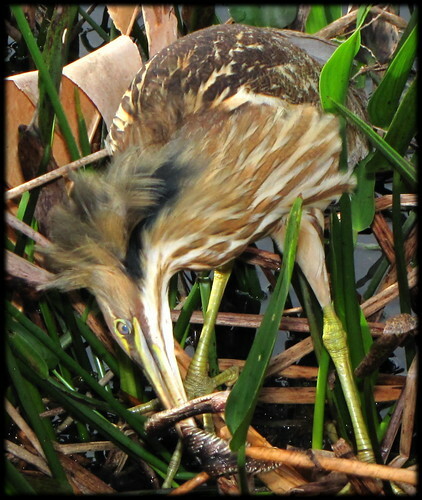 One of the neatest locals is the American Bittern, I call him Charley for short. We’ve seen Charlie on many occasions in the Cay and have spent some really neat time watching and photographing him. Today, while we were watching him up close on the North end of the Cay, he reached out and, to our surprise and amazement, grabbed a snake out of the water beside him and started to eat him. 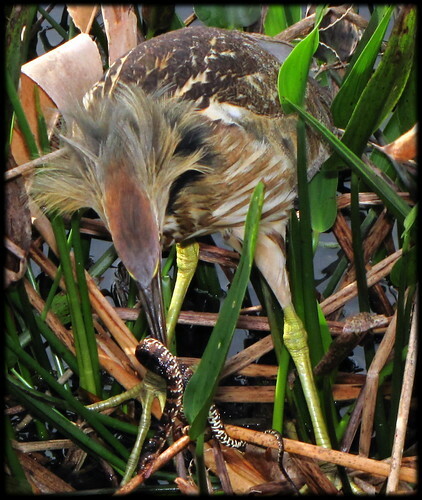 As you can imagine the snake was not impressed with Charley and grabbed the closest fallen Bulrush and wrapped himself into a knot and then wrapped a bunch of times around the limb. For about 15 minutes Charley and the snake fought and fought providing on-lookers some great entertainment. 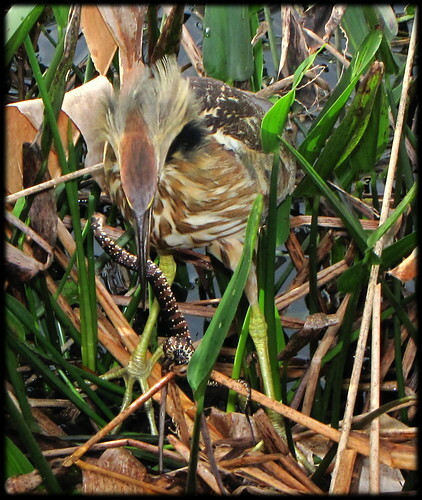 Charlie tugged and tugged and pulled, and chewed and pulled some more but the snake did not want to give up his life to become a meal for Charley, the American Bitter of Green Cay. 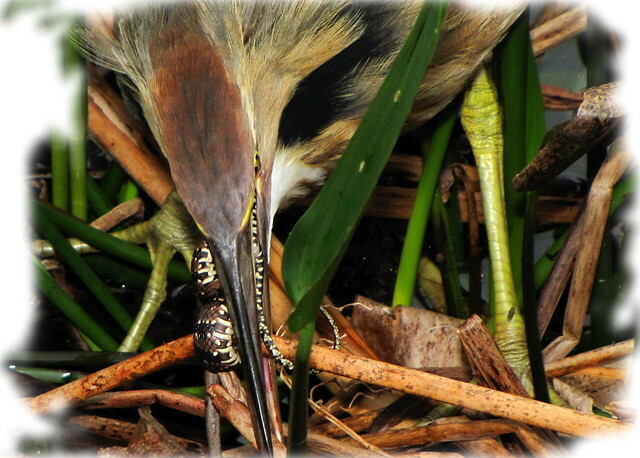 I was sequence shooting and actually have, sort of, stop-motion-animation with 100s of full resolution shots from the time Charley grabbed the snake until he finally untied him from the Bulrush and swallowed him. Another great day at Green Cay. We love it there. I just wish that the morons who use it as their personal workout racetrack would be more courteous and think of someone other than themselves. If you think that it’s great to be able to shoot from a dry wooden boardwalk then you’ve never tried to shoot with a 600mm lens from the middle of an elephant stampede and all the elephants are all yelling at their cell phones as they tramp by. Here is the slide show from Flickr. Next Post Osprey Takes a ride! Charley must be proud! He is certainly persistant. Great photos. I don’t know how you did it with the stampede (on cell phones) in full swing. Keep up the good work.